Our 2-Wire Snap Bipolar Base. The new base has 2 terminals to connect each polarized switch machine. Operate your Kato, Rokuhan, Rapido Trains, or other 2-wire snap switch machines with Touch Toggles. Our new Bipolar Snap-Action Base unit gives the Touch Toggle system the ability to control modern 2-wire polarized switches from Kato, Rapido Trains. This base works with any style of our Touch Toggles. Our large removable screw clamping terminals connect to your wire at each output. We offer plug adapters for Kato brand machines with short wires. These let you connect to your Kato plug-together system without cutting any wires. These adapter cables with our terminals let Kato users easily reverse the switch indication, so now you can decide which route shows red and which shows green. We offer this base alone, or in a package with four Touch Toggles or Mini-Cup Toggles of your choice. Our Circuits Protect Your Equipment! Like our 3 wire Snap Action Base, precise timing and charging circuits ensure that every switch machine gets the exact power it needs, and no machine will be left on to overheat. The Snap Action outputs should never overpower even a small switch machine. 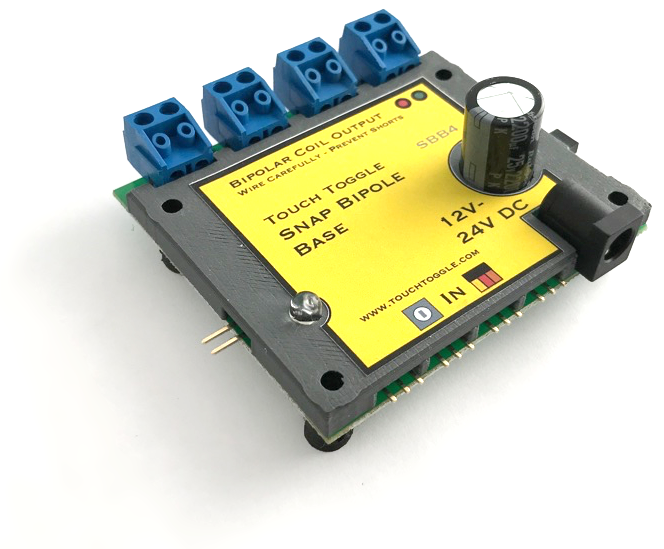 Each Bipolar Snap Action Base will control up to four 2-wire switch machines. The bases can connect side by side with other 12v bases to share a common power supply. Note: Most polarized machine designs are designed for powerful 16v-18v supplies. We offer a 24v High Voltage Power Supply that works well with Kato HO, Kato multiple switch crossovers, Rapido Trains, and other pre-electronic supply engineered machines. Our 24v High Voltage Supplies offer 24v to build a larger charge in the on-board capacitor. Remember that our electronics completely protect your turnouts. The power is on for only a fraction of a second, so no wires or coils can heat up or be damaged with such a brief pulse. Even the smallest N scale motors will just operate with a slightly louder click. Our high-powered outputs can handle a serious surge, so they are quite sturdy against all but direct shorts. That way users (like us) won’t ruin our investment or fun by being too casual about connections. We couldn’t make the output truly short-proof and still give the Oomph needed to throw some of the more stubborn switch machines so do be careful wiring them up. We’re sure enough of our gear that if you promise to be careful when you connect your wires, we’ll cover the replacement of your investment the first time it might fail from an accidental overload. The Bipolar Snap Action Base is approximately 2-3/4″ wide, 2-3/4″ deep, and 1-1/4″ tall. (70mm x 70mm x 32mm). Mount with four – #6 (5mm) screws. Each twin-coil machine should be connected to it’s own output for a full power snap. Our new Input Splitter lets you control 2 or 3 inputs from the same Touch Toggle. You can also use an Input Splitter and a Relay Base to add contacts to any turnout. Though most bipolar machines work well on 12v, some may require higher voltages. At this time we don’t offer higher voltage power supplies. We sell Terminal Power Adapters, so it’ll be easy enough to wire your own. Please read About Power for Touch Toggles for detailed information. The Bipolar Base drives Kato machines well, but you need to decide how you’ll be wiring your turnouts; You can cut off the plug on your Kato turnout or extension to use common wire to run to your turnouts, or use our Turnout Adapters at the base output terminals to provide a Kato type socket. Our adapters let you keep your Kato plug-in wires in just-from-the-factory condition. Our Kato AC Adapter lets you just plug in Kato accessory power to our Snap Bases. Comes prewired with Kato power plug; Plug and Play! Both these wiring accessories are listed in the menu below. Snap Bipolar Bases are in stock.